Honor, for some men that is all that defines them. What happens when you lose that honor? Worse yet, what happens if you lose that honor due to no fault of your own? How do you deal with that loss and regain your honor? 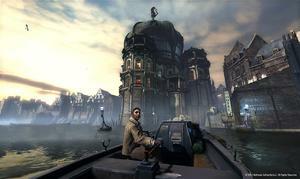 This is what Corvo, the main character in Dishonored, is faced with. Crovo was the Lord Protector of the Empress and returns from a long journey just in time to see the Empress get assassinated by a group a assassins with mystical powers. What happens when the guards do arrive? They blame Corvo for the murder. Now he is imprisoned for a crime he did not commit and as the the Empress' body guard, he is dishonored. Dark Vision - My most used powerCorvo is sent to jail for the crime that he has been framed for. The ones that keep him here know he is innocent. In fact, they tell him that they paid to have the Empress killed and that he happens to be a convenient scapegoat. 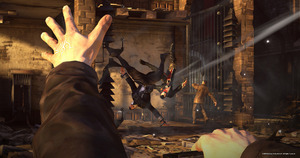 The day before his execution, Corvo finds that there are others who believe his innocence and receives assistance in escaping from the prison. Once free of this place he is taken to the Hounds Pit Pub. This is the home base of the Loyalist, a group of people that believe in sitting the Empress' daughter Emily to the throne. The kink in this plan is that she has been missing since her mother's murder. With Corvo freed they used him as a tool, they change him from protector to murderer in order to get their goals accomplished. This is when Corvo becomes an assassin. Corvo will be given a number of missions to remove key individuals. Individuals that stand in the way of the Loyalist ultimate goal. Corvo is a most formidable foe by himself. But when he attracts the attention of The Outsider he becomes a force that few can stand against. The Outsider is a being from the Void. He has access to powers beyond comprehension of mortal men, and he grants Corvo access to some of this power by granting Corvo his mark. These powers include the ability to move quickly from one point to another (blink), see through walls (dark vision), possess a creature (human and animal), stop time and more. Abilities can be gained and upgraded by collecting runes that are found using a special heart granted to you by The Outsider. Now to keep things interesting The Outsiders limits how these powers can be used via a mana pool. Simple abilities like blink and dark vision do use mana, but will regenerate it all shortly after it is used. This means as long as you don't use them rapid fire they are essentially mana free. The more intense abilities like possession and stopping time will use more mana, some of which will not regenerate. To restore you mana you will need to use a mana potion, commonly called Piero's Spiritual Remedy. Can't make it too easy can he? Well, you are free, you have some awesome abilities, now you have to rescue Emily and prove your innocence. To do this you are given the task to remove several people from key positions. How you do this is completely up to you. You have the tools to go in Rambo style. Kill everyone in your way and destroy the machines they use to block your path. You can do the assassin style where you sneak around, slitting throats and hiding the bodies. You can attempt the ghost route where you kill no one and are never actually seen. Or you can do a mix of all three, the choice is yours. They do not even limit how you do one of these. Once you can possess a creature you can run past guards as a rat, with blink you can take to the roof tops, or use wind blast on them to slam guards against walls. The choices are near limitless. Then once you reach your target you may even be able to remove them alive. There will always be a non-lethal option to take care of the target, the question is are you that benevolent, and can you live with the life that you have left them with? Now I can't do a review with out complaining at least a little bit. I did find the game a little short overall. 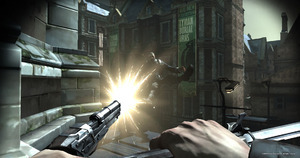 Dishonored has a total of 6 "missions". These missions vary in length and do have hidden goals for completion along with money and other items. In one there was a hidden goal for a successful dual. Another had a mission goal of saving an NPC from quarantine. They don't always tell you of these ahead of time, it adds a bit of length to the game, and gives it replay value. Mixed with the different ways to play a mission you will most be able to get at least to play throughs. Also, while the game does have an exploratory feel to it, you can only explore areas during specific missions. If you missed something or want to go back you need to replay the mission from the start screen. While not having to trudge around to different areas, fans of sand box games will be a tad disappointed as the game is very linear, especially for something coming from Bethesda. These are minor gripes though and should not detract from how much fun the game actually is.